I bought seventeen books when I was in London. Which, purely by coincidence, is the same number of books I bought last time I was in London. I don't usually look for specific books. I just wander through any bookstore I come across and buy anything that catches my eye. When I have so many books that I am starting to worry about transporting them home I try to curtail my purchases. This is hard since even though I shouldn't buy any more books I continue to wander through bookstores. And if you can wander through a bookstore without wanting to purchase more books then you are a stronger person than I am. I bought mainly non-fiction this time--eleven are non-fiction and six are fiction. Before I left for London I asked on Twitter for bookstore recommendations. I ended up with a list it would have taken me a month to work through. 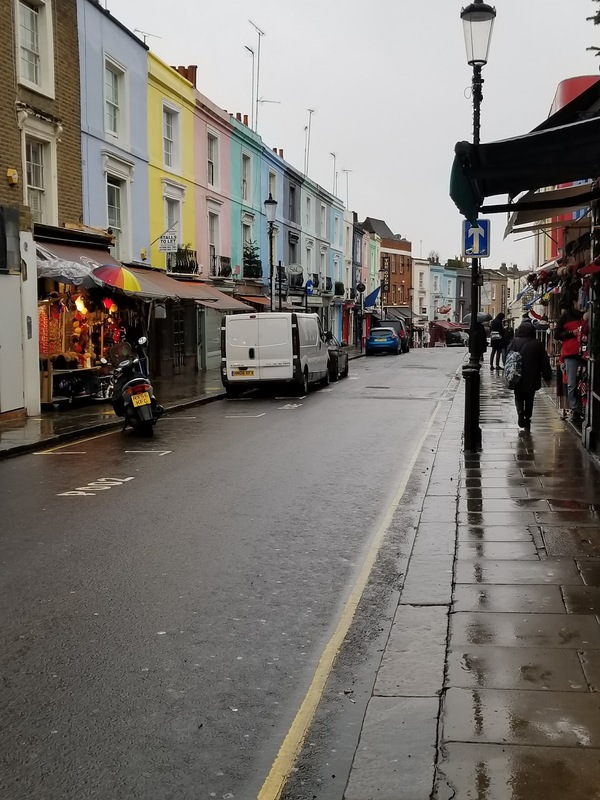 Mind you, I would have been happy to stay in London for a month but instead I will just have to go back to continue my bookstore quest. 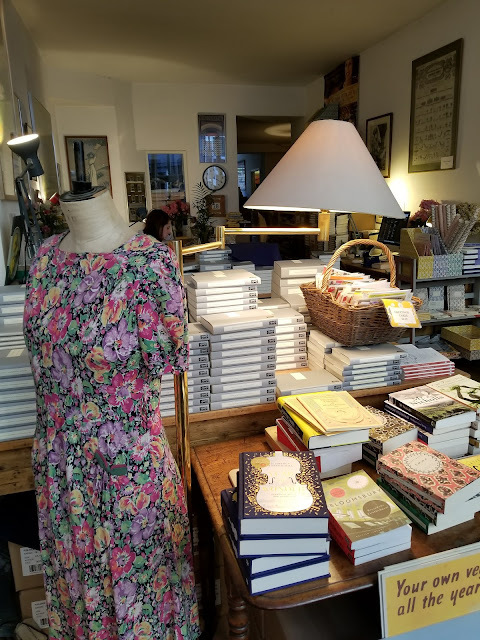 Of course I went to Persephone Books. 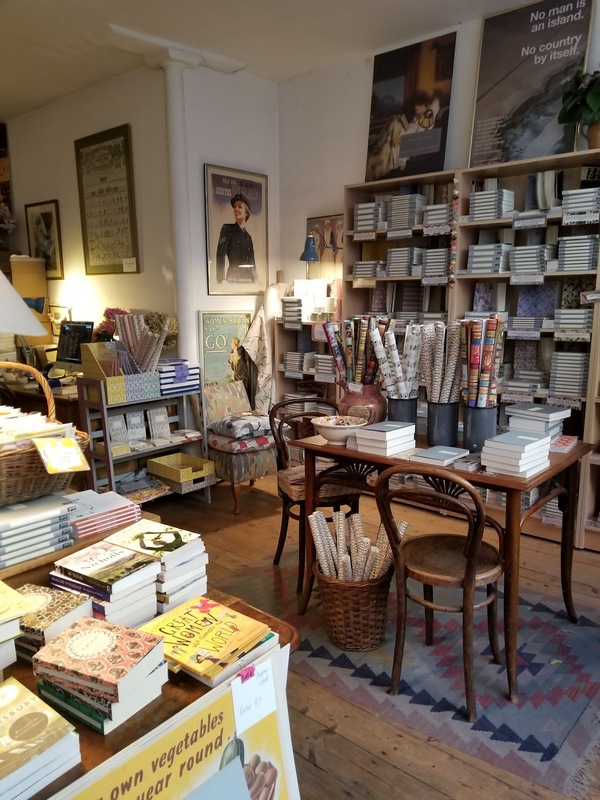 I refuse to visit London unless I also visit Persephone Books. It is just so wonderful. I bought three books. 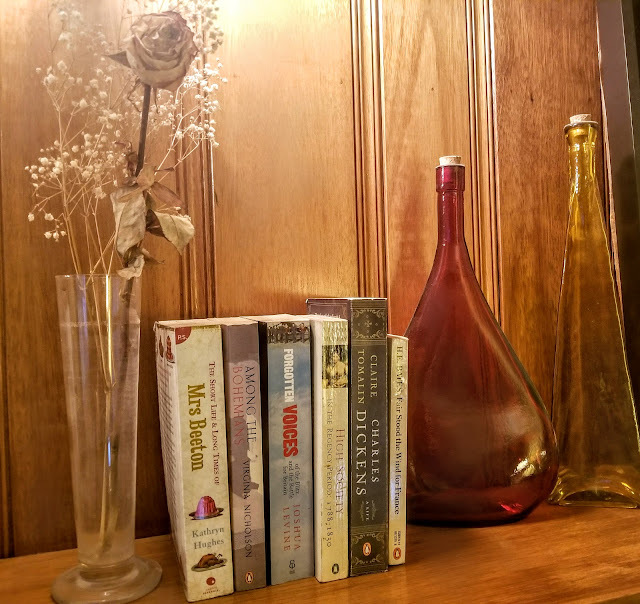 They are House-Bound by Winifred Peck, They Knew Mr. Knight by Dorothy Whipple, and A House in the Country by Jocelyn Playfair. I went to Waterstones a few times. 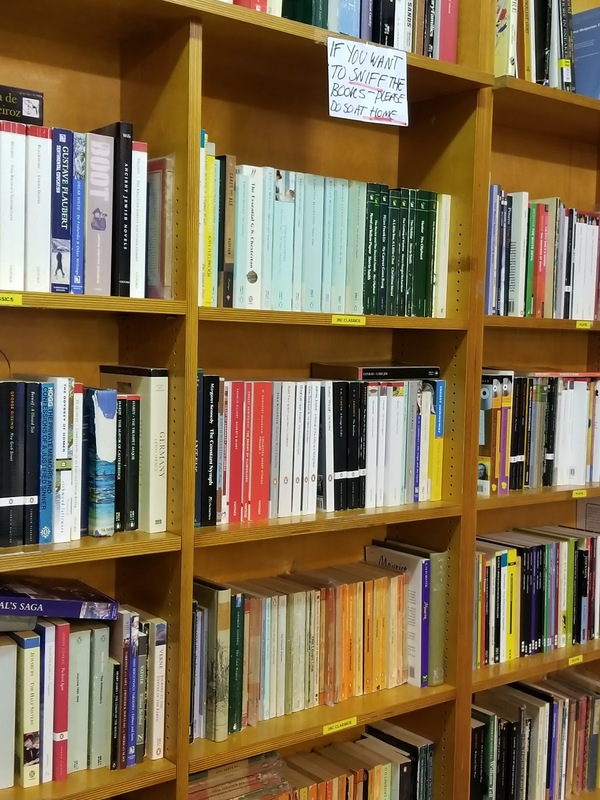 I usually try to frequent more of the small, second-hand bookstores but we were there over Christmas week and many of them were closed. Plus, Waterstones is an excellent place to duck into when you are cold and your husband needs another cup of coffee. I bought four books there during the course of the week. The Diary of a Bookseller is the only one I was specifically looking for. I read a few rave reviews about it so knew it was a book I wanted to bring home. It is also the only book I have read so far and I thoroughly enjoyed it. The Marches by Rory Stewart is one my husband found for me. Actually, he found it on a whole table of books about the U.K. countryside. I could have bought them all. He insisted I also buy Jane Austen's England. I wasn't going to but he said could I please just buy it right then because otherwise we would just have to return when I changed my mind. That man knows me very well. Letters From the Suitcase is the correspondence between a couple during WWII. Obviously, I was going to have to buy it. Skoob Books was a recommendation from someone on Twitter. We bought three books there. One is my husband's-something scientific about the way our brains work, one was a Penguin mystery for my mom to go with the Penguin Tote bag I bought her, and one was for me. It is Together and Apart by Margaret Kennedy. I read The Feast by Kennedy last year and enjoyed it so I was happy to find another lovely Virago by her. Any Amount of Books is a wonderful bookshop on Charing Cross Road. It is small and was jammed full of people sheltering from the rain and I loved it. So, thank you to the several people on Twitter who recommended it. The basement is full of bargains. I don't have any photos because it was so busy but here are the three books I bought. I read Watching the English a few years ago and wouldn't mind re-reading it. I was also pleased to find an Ivy Compton-Burnett. I read one of her books a few years ago and somehow how never gotten around to reading another. That will be remedied now. 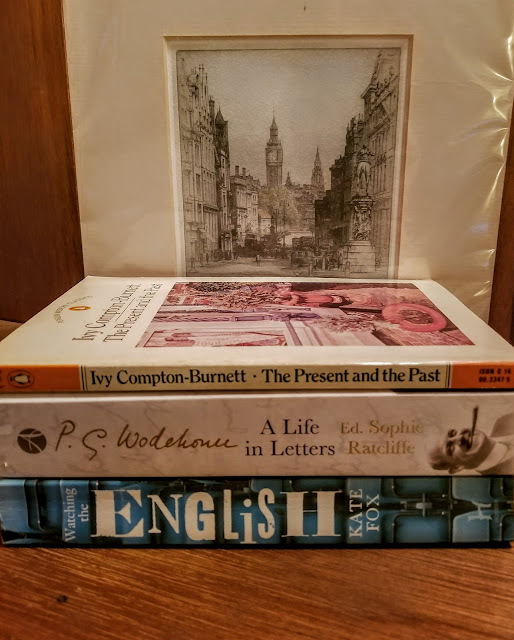 P. G. Wodehouse-A Life in Letters was reviewed on a blog recently (I can't remember which blog) so it seemed like a fortuitous find. Besides, I grew up on Wodehouse. Notting Hill Book & Comic Exchange was another Twitter recommendation. It was wonderful. I ended up having to cull my pile of books because this was an early stop in the week and I didn't want to buy too many books right away. I still bought six so you can imagine what my initial pile was like. I was particularly pleased to find the life of Charles Dickens since I read Tomalin's biography of Jane Austen a year or so ago and thought it was very well done. I am deeply regretting all the bookstores I didn't manage to get to. A few were closed. For example, we tried to go to Heywood Hill and I was very disappointed when we arrived and it was shut for the week. And as for the rest, we just ran out of time. I'll have to go back. Maybe with an extra suitcase and definitely with my very patient husband. I'm sorry...I think. It was definitely a trip to envy. So fun and so relaxing all at the same time. I've read two of Dorothy Whipple's books (Because of the Lockwoods and The Great Mr. Knight - the same book you bought with an alternate title) and loved them both. As you know, they're almost impossible to find in the U.S. 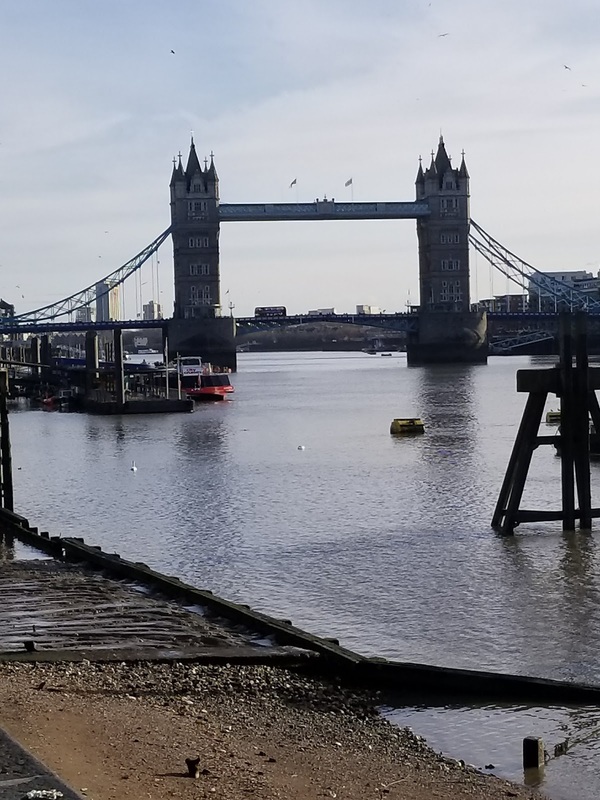 I haven't been to London for almost twenty years, so maybe it's time for a trip! Probably good thing some bookstores were closed, considering! I am dying to go to Persephone, and so sad the Slightly Foxed store closed before I could visit. It probably is a good thing some were closed. I was having trouble practicing any restraint. I feel the same about the Slightly Foxed store. I would have loved to visit. It sounds like you had a great time. I love to visit bookstores on cities that I visit. I would like to do so in London some day. Have a good time reading those books. I always look for the bookstores in the cities I visit. It is just a pity there aren't more of them around in U.S. cities. Or maybe I am just visiting the wrong cities. I'm so envious! Especially about Persephone, but also those second-hand-book shops. Thank you for all the lovely photos. I'm glad you liked the photos. I certainly had fun taking them! 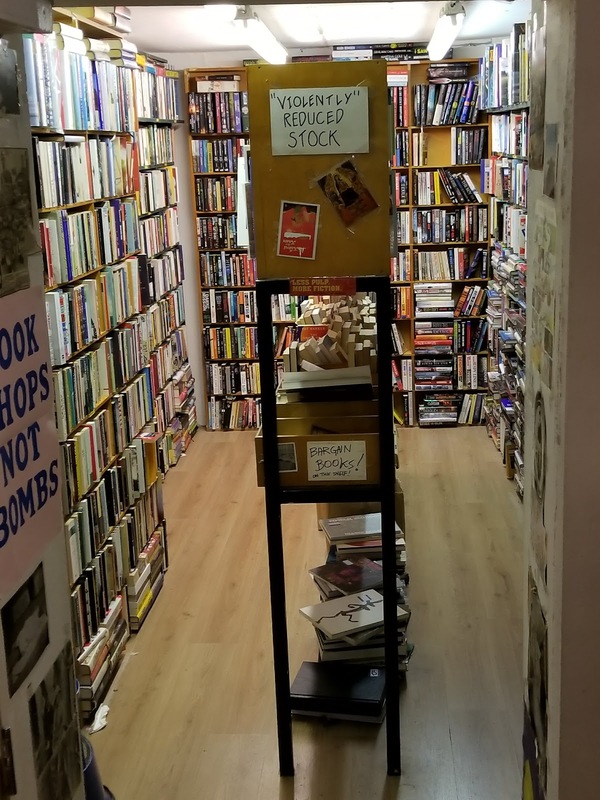 The second-hand bookshops were amazing. They were so much fun to browse through. I'm also sad that I never got the chance to visit Slightly Foxed! We were about to go and then realized it was about to close for the day, and that turned out to be the last chance I had. I went to Persephone on that trip, but I wish I'd chosen SF instead of the still thriving Persephone. My husband is a long-time Foyles devotee. Love the photos of the funny hand-written signs. It is such a pity they closed. And such a pity we can't manage to fit in all we want to do on vacation! I believe you were the person who recommended the bookshop in Notting Hill so thank you for that. There were so many others I would have loved to visit. I don't really have any bookshops near where I live so I am like a kid in a candy store when I visit the U.K. I know. I am jealous of December-me. Looks like a lovely bookish trip! I don't think I could be trusted in any of these London bookshops. I hope you enjoy your new books and that you are able to visit the rest of the bookstores on your list very soon! It was lovely. London bookshops are wonderful and I am already dreaming of another trip.